"Few men are willing to brave the disapproval of their fellows, the censure of their colleagues, the wrath of their society. Moral courage is a rarer commodity than bravery in battle or great intelligence. Yet it is the one essential, vital quality for those who seek to change a world which yields most painfully to change." Project History My decision to paint “Whistleblowers” came from my examination of this exceptional group of people, willing to bring enormous controversy and upheaval upon themselves for seemingly little to no reward. Many of these people have lost careers, family, friends, or even paid with their lives for their claims and actions. Some have been incarcerated, and most of them endure varying degrees of scorn and ridicule. Former CIA operative Robert Steele who I include in my series defines the term “Whistleblower" as the following; a person who informs on a person or organization engaged in an illicit activity. However, I broaden this term to include informers who bring previously unknown and unaccepted information forward. Suppressed ideas contrary to political, corporate, scientific, environmental, medical and religious norms and interests. 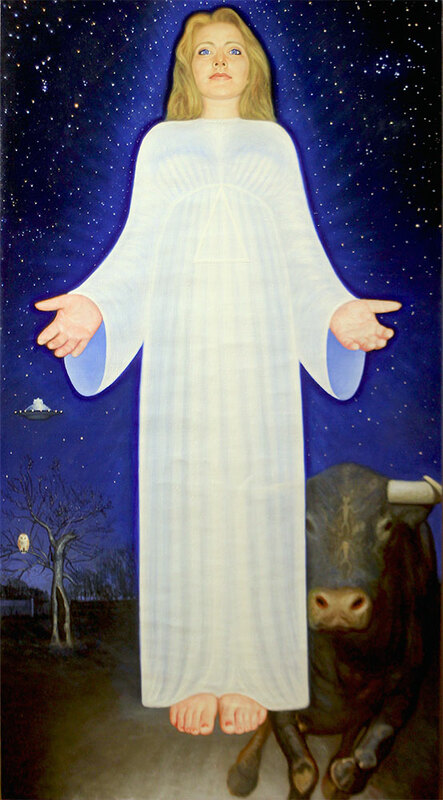 My main focus is with informers within the UFO,E.T. and “classified” topics. This topic in my opinion is the greatest story never told, and the next great step mankind needs to take. Hidden discoveries such as "free energy” anti-gravity devices, as well as evidence of other worldly intelligence would change the entire paradigm in which we live. The portraits I have created are of people living as well as some deceased. This is in no way a comprehensive list or in any order of importance. They are people who have gained my attention thus far in this ongoing art project. I leave it up to the viewer to decide as to each of their contributions and merit. By having them viewed in the context of "Art”, my hope is they can be discovered by a new audience and reevaluated by a previous one. When considering the phrase ”follow the money”, it appears to me there is little evidence it applies here. Most of these people endure hardship and harassment for their claims and live less than glamorous lives. I hope the viewer will take a closer look at these individuals and their claims. I feel we owe them this consideration. 1. a person who informs on a person or organization engaged in an illicit activity. I chose to paint 50 small portraits in a 9”x12” oil on panel format as one collective work. 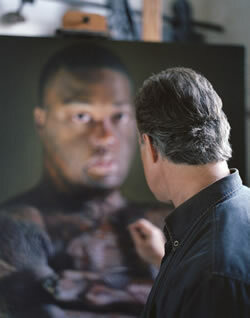 Each painting was created in an "alla prima" style, considering likeness while preserving a sense of paint. They are not detail concerned but rather intended to capture the feel and spirit of each individual. Project History My initial inspiration for this series happened 30 years ago when I encountered a thirteen year old burn survivor. Her facial burns were so severe that she lacked discernable features such as a nose, lips and ears. Although aware that a sensitive human being was peering through her facial disfigurement, her visual facts caught me off guard. I stared at her face in shock and disbelief. As she turned and walked away, I realized I must have been one of many that perceived her that way. It was the first time I saw a burned person. I felt saddened for her tragedy, and later embarrassed in my reaction. I remembered the encounter for many years. 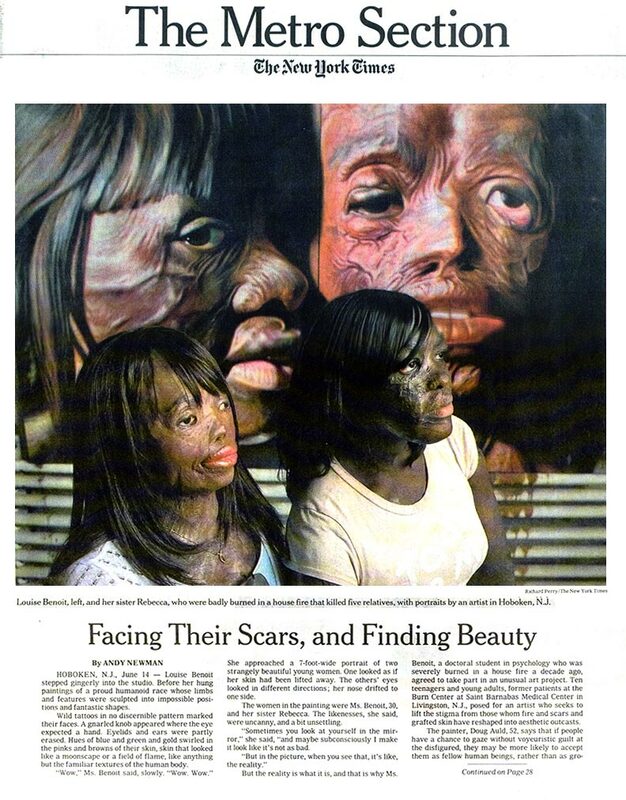 In 2002, I presented the idea of painting portraits of burn survivors to the Burn Center at Saint Barnabas Medical Center in Livingston New Jersey. They agreed to participate in the project by enrolling the burn survivors. The young people that have volunteered for this series have all endured physical pain and personal tragedy. They have developed a strong sense of 'self ' at an early age in order to survive public alienation due to their appearance. Many of them lost family members in the fires that they survived. 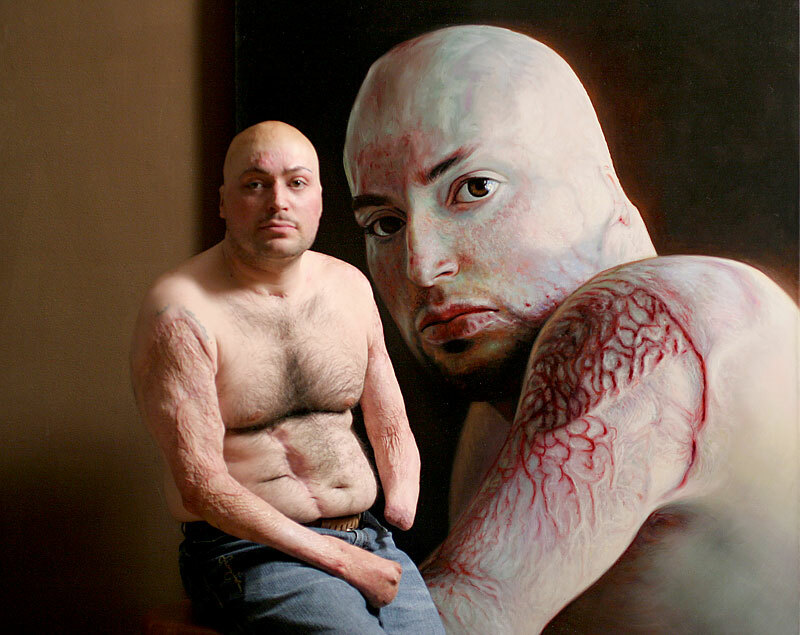 My motivation to paint them is rooted in the desire to explore the parameters of beauty in our society. These paintings document their visual facts while interpreting the less tangible aspects of inner beauty and personal character. As a visual artist, I have always been interested in the human face and our primal response to it. As infants we are hard wired to respond to faces in their simplest form. Dolls, puppets, and robots will ellicit a response in us as if these objects are 'living' or 'real.' Within the features of a face there is a 'symmetry' or 'lack of ' that humans respond to in positive or negative ways. Science has determined that what we call 'beauty,' is determined by angles, measurements and symmetry of features. However, non physical 'human' traits such as personality, inner strength, confidence, and character can redefine our perception of who we find to be beautiful. Special thanks to Kathe Conlon and Roy Bond of the St. Barnabas Medical Center in Livingston NJ. who trusted the spirit of my intentions and helped give this project its beginning. By making a monumental oil painting of a badly disfigured face, Auld evokes the absence of such faces from the art of the past – and from the larger social consciousness that past represents. A thing is beautiful when it is strong in it's kind. Project History In the late 80’s, I began a series of paintings that explored the possibility of two coexisting visual realities that portrayed man and nature in a visual coexistence. A specific, recognizable face and a consistent living environment were chosen to enable the viewer to participate in this visual game and marvel at the completion of the image. My never ending fascination with nature, science, mechanics and culture inspired and yielded this exciting imagery. These works were all done by hand, without any use of a computer. The paintings display a sort of "visual chess" creating one image at a time, one move at a time, in order to create the whole. Project History I have always been fascinated with our exteriors and how they can belie what lies beneath. Uniforms are very powerful , be it a Cop, Religious figure or a Businessman. They give the impression of authority and integrity, whereas in reality, they are often just the opposite when the uniform comes off. Beneath our external disguise we are all just people. We share the same traits, same wishes, fears, desires with aspects of sincerity and deception. My paintings in this series, tampers with elements of " expectation " in accordance with these norms. So I began a series of photorealistic tools, all hand done with oil and brush. I found that tools with their refelective chrome, transparent lucite handles and varied shapes to be like little jewels, not traditionally seen as objects of Art. This series of large paintings with their dazzling colors and reflective qualities have been a favorite of many viewers over the years. 1) Normal everyday objects acting in abnormal ways. ie A cow flying. 2) Abnormal things acting in a normal ways. ie A three headed cow walking. 3) Abnormal things acting in abnormal ways. ie A three headed cow flying. Seeing the paintings of Salvatore Dali, and other early surrealists made a big impression on me, my work, and my thinking. The paintings in this section express varying aspects of these influences. "The Lady of Light" also called "The Shining Lady" is an original painting I did, inspired by true events described to me by experiencer Chris Bledsoe. Chris and I met after I contacted him following my watching a UFO, ET encounter called the “Fayetteville Incident” on the History Channel. I was so moved by the event that I took time to make a visit and stay at Chris Bledsoe's home upon his invitation. After getting to know Chris, meeting his great family and then going down to the Cape Fear River where his initial encounter began, Chris further described to me an amazing story of a shining lady emanating blue light in the darkness of his backyard. As incredible as his initial sighting was, Chris stressed to me over and over that it's really about the Lady, God and Angels, and that all through history this reality has been explained in different ways and different forms. After taking notes and meditating on the idea for about a year's time, I finally decided to attempt to paint this vision Chris had, and so during Christmas of 2014, I began. Upon seeing the painting for the first time, Chris was amazed at how accurately I captured the inspiring and unforgettable event he had experienced that night. As a child, Doug had a fascination with nature and wildlife as well as mechanical things. Curious as to how things worked, he enjoyed taking things apart and re-assembling them, which later became integral in the making of his art. 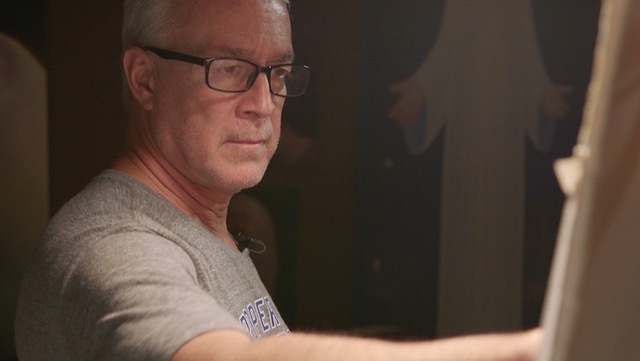 While still in high school, Doug saw the band, The Doors, and it changed his life. Switching over from auto mechanics to piano tuning and rebuilding for income, he also began to study the piano and classical music. He formed a band called East Agony, playing his original music in venues in the NY/NJ area including CBGB in NYC. But after seeing the paintings of Salvador Dali, he began to pursue visual Art, being attracted to the idea of working alone. Initially self-taught, Doug also studied at the Art Students League, School of Visual Arts and The New York Academy in NYC. Today, Doug continues making art as well as songwriting, up to present day.